Enterprise Architect provides a number of ways to create completely new elements and those derived from existing elements. The simplest of the methods for creating a new element is to drag the icon for the required type of element from the Diagram Toolbox onto a diagram, as shown. This method creates the element according to the system standard for that element type. 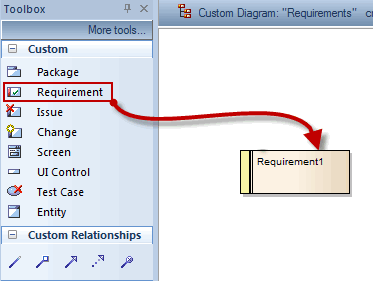 You can also provide alternative element definitions that the Toolbox icons reference (using the system 'Preferences' dialog, Patterns or element Templates) and add further element definitions using Profiles and MDG Technologies (either supplied with the system or developed by your project team).